Most investors will agree that the goal of investing is typically to make a profit. Knowing exactly how to do that can require not only stock market understanding but investing tools to help meet the investor’s goals. One invaluable tool in helping protect your profits is a stop loss order or a trailing stop loss order. With a stop loss order, the investor authorizes the broker to sell stock at a predetermined price point. For example, if the price of the stock is $100.00, you can set your stop loss order at 25%. If the price of the stock drops to $75.00, a market order will automatically be triggered by the brokerage company and the stock will be sold at the current price ($75.00). This helps to ensure the investor will cap their losses on the stock to around 25%. A trailing stop loss order is even more helpful. 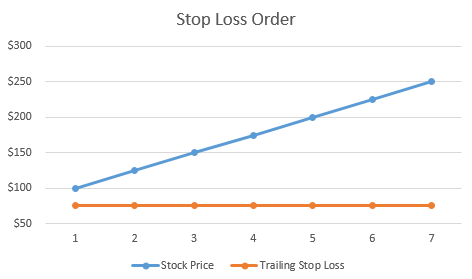 Operating on the same basic premise as a stop loss order, your losses will be capped at the stated percentage. Additionally, there is the added capability of setting a trailing amount which makes the order more flexible. As the price of the stock goes up, your stop loss “profit” is allowed to rise as well. Essentially the price at which the stock should be sold also rises. For example, let’s say the stock purchase price is $100.00, and your trailing stop order is 25%. If the stock drops to $75.00, the stock is sold. However, if the price rises to $200.00, by using a trailing stop loss order new threshold is set at $150.00. If the price of the stock drops below that point ($150.00), a market order will automatically be triggered by the brokerage company and the stock will be sold at that price ($150.00). You realize a profit on the stock along with the assurance that your losses do not exceed 25% of the stocks highest price. Having this capability to prevent losses from plummeting while protecting your profits helps manage your investments more effectively. 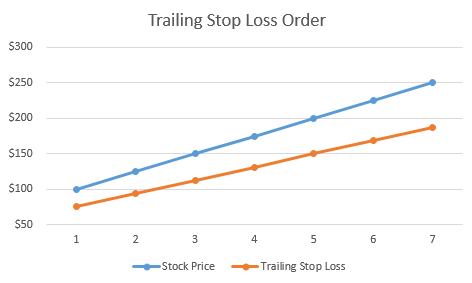 Being able to do both automatically through a trailing stop loss order is the ultimate convenience. I placed a stop loss order for bellway on 22-6-16 for a sell at 2500-2450, The stock was priced at 2678.00 at close of 22-6-16. The order was dated until 22-7-16. The sell was not activated and I want to know why? The stop loss was placed with selftrade with whom I have an account. They are having investigation. Sorry to hear your stop loss was not triggered by your brokerage. The issue you describe is one of the reasons we built StopLossTracker. We wanted a tool to notify us when the stop loss is hit so we can make an educated decision to sell rather than depending on a brokerage to execute the trade. We look forward to having you join us at StopLossTracker!